Cesar Canine Cuisine is holding a really special promotion during BlogPaws West in Denver as part of their Love Your Dog back campaign. And, the best part? Their promotion is open to both BlogPaws attendees AND those who couldn’t make it to Denver! Cesar is sponsoring My Tail Hurts From Wagging So Much’s attendance at BlogPaws, and along with the great folks at Dog Tipper, we will be working with Cesar to spread their message of loving your dog back. 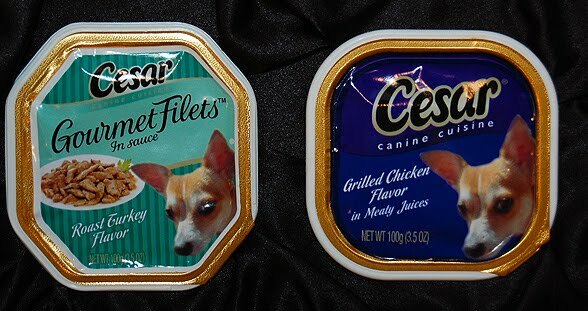 As part of our sponsorship, they sent us these awesome Cesar food products with Toby’s face on them! How awesome is that?! For bloggers attending BlogPaws: Tweet with the hashtag #LoveThemBack and share how you love back your dog or how your dogs go crazy for Cesar Canine Cuisine food or treats. Cesar will send you one care package AND one to give away to a reader of your blog after the conference. For those not attending BlogPaws: Encourage others to tweet their canine story of love with the hashtag #LoveThemBack to receive one Cesar Canine Cuisine Blog Paws package. Each care package will include: 1 Cesar shirt, 4 Cesar Bistro entrees, 1 Cesar treats purse, 1 Cesar serving dish and 1 Cesar bag to hold it all with Cesar tissue. The promotion is open to resident in the U.S. and Canada and runs from 9/9/10 to 9/12/10. For those attending BlogPaws there is a limit total of 2 care packages per participating blogger, and is limited to 300 bloggers. For those not attending BlogPaws, the promotion is limited to to 500 blogger tweets and one care package per blogger. Remember to follow us, Cesar Canine Cuisine and Dog Tipper on Twitter, as we will be tweeting about #LoveThemBack and other BlogPaws events. We will also be giving away other cool Cesar prizes to our readers. More details on that in a few days! Previous Post Free Dog Food Sample and Help a Shelter in Need! Next Post BlogPaws – It’s a Blogging Conference So Why Haven’t You Blogged? Just hopping by!! Following you…follow us back to our blog!